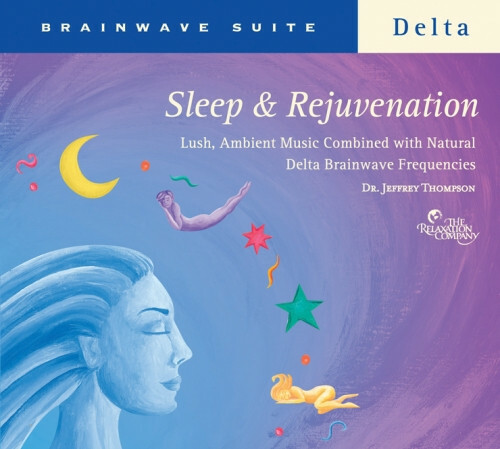 Delta waves are embedded into a soothing soundtrack for deep relaxation amd restful sleep. Simply play this uniquely soothing musical program in the background to enjoy states of rejuvenating, relaxation and deep, restful sleep—easily and naturally. We all experience many states of consciousness, from ordinary waking and sleeping states to extraordinary states in which we are more at peace, particularly aware, or unusually creative. Each of these states has a unique pattern of brainwaves. Track 1: "Rejuvenating Relaxation" contains soothing sounds of chirping birds, flowing streams, and resonant tones of Tibetan bowls with light-to-mid delta waves to help you release physical tension and trigger a deep relaxation response. Track 2: "Deep Sleep" contains restful sounds of ocean waves, songs of whales and dolphins, and mid-to-deep delta waves to lead you to restful sleep. If you have difficulty falling asleep, simply allow the music to guide your brainwaves into rejuvenating delta sleep. If you have difficulty staying asleep throughout the night, put the recording on repeat mode to play all night long. Dr. Jeffrey Thompson's audio programs, based on 25 years of clinical research, are used by Fortune 500 companies, healthcare professionals, and more than a million individuals worldwide.